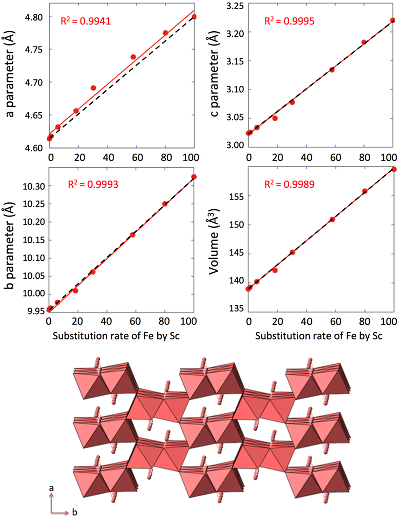 Levard, C., Borschneck, D., Grauby, O., Rose, J., Ambrosi, J.-P. (2018) Goethite, a tailor-made host for the critical metal scandium: The FexSc(1-x)OOH solid solution. Geochem. Persp. Let. 9, 16–20. Scandium is the subject of increasing interest and is even becoming critical for a number of institutions in Europe and the U.S.A. among others because of its economic value and supply risk. Despite this growing awareness, little is known about its geochemical behaviour. Recent studies have shown that Sc can be strongly associated with iron oxides including goethite but the mode of interaction is not yet fully understood. 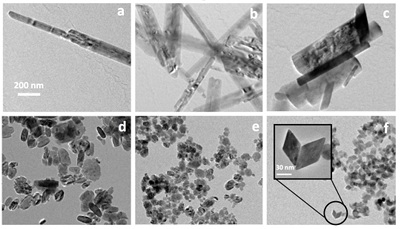 We investigated the incorporation of Sc in goethite structure in controlled batch systems. For the first time, we show the formation of a solid αFeOOH-αScOOH solution consistent with an ideal solution despite significant differences in atomic radii between Sc3+ and Fe3+. We believe that beyond this fundamental knowledge concerning the affinity of Sc for goethite, these results provide important insights into Sc speciation in primary or secondary sources, including Sc-rich lateritic deposits and bauxite residues after alumina extraction, for the future design of extraction processes with a low environmental footprint, as an alternative to current energy-intensive technologies. Table 1 Relative abundances of Sc measured by ICP-AES and EDX/TEM. Figure 1 X-ray diffractograms for goethite, ScOOH and Sc-doped goethite samples. Figure 2 Top: Changes in cell parameters and in cell volume as a function of rate of substitution of Fe by Sc (numerical data for cell parameters and errors can be found in SI). Dashed lines represent ideal Vegard’s law behaviour. Bottom: Crystal structure of goethite. The octahedrons represent the Fe surrounded by 6 oxygen atoms. Spheres represent the hydrogen atoms. Figure 3 TEM images of samples #1 (a) (0 % Sc), #2 (b) (1.2 % Sc), #3 (c) (5.8 % Sc) #5 (d) (30.2 % Sc), #6 (e) (57.9 % Sc) and #8 (f) (100 % Sc). All images are at the same scale (a) except the inset in image (f). Wang, W., Pranolo, Y., Cheng, C.Y. (2011) Metallurgical processes for scandium recovery from various resources: A review. Hydrometallurgy 108, 100-108. Frondel, C. (1968) Crystal chemistry of scandium as a trace element in minerals. Zeitschrift für Kristallographie 127, 121-138.
) but in such small amounts that its structural effect on the host mineral in most cases, remains unexplored. Das, S., Gaustad, G., Sekar, A., Williams, E. (2018) Techno-economic analysis of supercritical extraction of rare earth elements from coal ash. Journal of Cleaner Production 189, 539-551. Chassé, M., Griffin, W.L., O'Reilly, S.Y., Calas, G. (2017) Scandium speciation in a world-class lateritic deposit. Geochemical Perspectives Letters 3, 105-114. Vind, J., Malfliet, A., Bonomi, C., Paiste, P., Sajó, I.E., Blanpain, B., Tkaczyk, A.H., Vassiliadou, V., Panias, D. (2018) Modes of occurrences of scandium in Greek bauxite and bauxite residue. Minerals Engineering 123, 35-48. To better understand the potential dynamics of Sc in such iron-rich environments, we investigated the substitution of Fe by Sc in the goethite structure. Here we present a continuous solid solution αFeOOH-αScOOH for the first time. To the best of our knowledge, this is also the first report of a continuous solid solution with goethite. We believe these results are a key to a better understanding of the fate of Sc in the environment and also provide important knowledge for the recovery of Sc from Fe-rich primary or secondary deposits. Schwertmann, U., Cornell, R.M. (1991) Iron Oxides in the Laboratory, Preparation and Characterization. VCH. Weinheim. with modifications. First, 25 mL of a 1 M solution of iron (III) nitrate and scandium (III) nitrate was prepared with ultra-pure (UP) water and varying Sc molar proportions (0, 1, 5, 15, 25, 50, 75 and 100 mol. %). Then, 45 mL of 5 M KOH were added to each solution, which was diluted with UP water to reach a final concentration of Fe + Sc of 0.05 M. The final pH of the solutions was 13.3 ± 0.2. The solutions were heated at 70 °C in Teflon flasks for 10 days. The solutions were cooled at room temperature, centrifuged at 4000 g for 15 minutes and washed several times with UP water until the pH reached 7-8. Finally, the recovered products were dried in an oven at 40 °C for two days. Doebelin, N., Kleeberg, R. (2015) Profex: a graphical user interface for the Rietveld refinement program BGMN. Journal of Applied Crystallography 48, 1573-1580.
) was used for Rietveld refinement to determine the cell parameters of the (Fe,Sc)OOH samples. The obtained particles were characterised using a transmission electron microscope (TEM, JEOL JEM 2011) coupled with an energy dispersive X-ray spectrometer (EDX, X-Flash Silicon Drift Detector 5030, Bruker). Further details on sample characterisation are provided in Supplementary Information. The relative molar concentrations of Sc were found to be close to the nominal concentration (Table 1). More importantly, the relative abundance of Sc measured at the bulk scale by ICP-AES was similar to the abundances measured at the particle scale (Table 1). This similarity is an indication that, at the particle scale, no demixing occurred whatever the initial Sc amount. Calculated standard deviation based on the measurements of Fe and Sc concentrations on 5 replicates (ICP-AES), and on 10 particle aggregates (EDX/TEM). Schulze, D.G. (1984) The influence of aluminum on iron oxides. VIII. Unit-cell dimensions of Al-substituted goethites and estimation of Al from them. Clays and Clay Minerals 32, 36-44. Jacob, K.T., Raj, S., Rannesh, L. (2007) Vegard's law: a fundamental relation or an approximation? International Journal of Materials Research 98, 776-779. Burleson, D.J., Penn, R.L. (2006) Two-Step Growth of Goethite from Ferrihydrite. Langmuir 22, 402-409. Zhang, Y.-W., Liu, J.-H., Si, R., Yan, Z.-G., Yan, C.-H. (2005) Phase Evolution, Texture Behavior, and Surface Chemistry of Hydrothermally Derived Scandium (Hydrous) Oxide Nanostructures. The Journal of Physical Chemistry B 109, 18324-18331. Jolivet, J.-P., Froidefond, C., Pottier, A., Chanéac, C., Cassaignon, S., Tronc, E., Euzen, P. (2004) Size tailoring of oxide nanoparticles by precipitation in aqueous medium. A semi-quantitative modelling. Journal of Materials Chemistry 14, 3281-3288. Ebinger, M.H., Schulze, D.G. (1989) Mn-substituted goethite and Fe-substituted groutite synthesized at acid pH. Clays and Clay Minerals 37, 151-156. Martin, F., Ildefonse, P., Hazemann, J.L., Mathe, P.E., Noack, Y., Grauby, O., Beziat, D., de Parseval, P. (1997) Gallium Crystal Chemistry in Synthetic Goethites. Journal de Physique IV France 7, C2-821-C2-822. Scheinost, A.C., H., S., Schulze, D.G., Gasser, U., Sparks, D.L. (2001) Structural environment and oxidation state of Mn in goethite-groutite solid-solutions. American Mineralogist 86, 139-146. Sileo, E.E., Ramos, A.Y., Magaz, G.E., Blesa, M.A. (2004) Long-range vs. short-range ordering in synthetic Cr-substituted goethites. Geochimica et Cosmochimica Acta 68, 3053-3063. Alvarez, M., Sileo, E.E., Rueda, E.H. (2008) Structure and reactivity of synthetic Co-substituted goethites. American Mineralogist 93, 584-590. Bazilevskaya, E., Archibald, D.D., Aryanpour, M., Kubicki, J.D., Martínez, C.E. (2011) Aluminum coprecipitates with Fe (hydr)oxides: Does isomorphous substitution of Al3+ for Fe3+ in goethite occur? Geochimica et Cosmochimica Acta 75, 4667-4683. Cornell, R.M., Schwertmann, U. (2003) The Iron Oxides: Structure, Properties, Reactions, Occurrences and Uses. Second edition, WILEY-VCH. Weinheim. Cornu, S., Deschatrettes, V., Salvador-Blanes, S., Clozel, B., Hardy, M., Branchut, S., Le Forestier, L. (2005) Trace element accumulation in Mn—Fe—oxide nodules of a planosolic horizon. Geoderma 125, 11-24. Shannon, R. (1976) Revised effective ionic radii and systematic studies of interatomic distances in halides and chalcogenides. Acta Crystallographica Section A 32, 751-767. ). Although the chemistry of Ga is similar to that of Al, Ga has an ionic radius closer to that of Fe (62 pm), which, in theory, could facilitate substitution. The authors observed a solid solution up to 40 atomic percent and demixing above this threshold with the formation of two distinct phases, one goethite and one GaOOH similar to that observed with the αAlOOH/αFeOOH system. All these studies confirm that the successful substitution of Fe by trivalent atoms involves a complex interplay between different factors including ionic radii, geometrical distortion of various origins (e.g., the Jahn Teller effect) and the nature of bonding, which can be affected by electronegativity. However, to the best of our knowledge, this is the first time an apparent ideal solid solution has been observed with goethite as an end member despite significant differences in the properties of Fe and Sc. Majzlan, J., Navrotsky, A. (2003) Thermodynamics of the goethite-diaspore solid solution. European Journal of Mineralogy 15, 495-501. ). 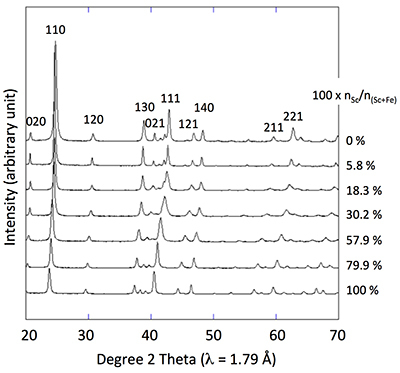 Additionally, further investigation is now underway to understand the mechanism behind substitution of Sc in the goethite structure at the atomic scale. In particular, the presence or absence of clusters within the solid solution will be investigated using X-ray spectroscopy. Although synthesised in conditions far from the ones prevailing in many natural environments, these results will potentially bring important information on Sc geochemical behaviour in Fe-rich environments. However, structural analogy between synthetic and natural Sc-doped goethite needs to be further explored. Additionally, these results provide important insights into Sc speciation in primary or secondary sources for the design of extraction processes with a low environmental footprint as an alternative to the currently used energy-intensive technologies. This work was carried out thanks to financial support from CNRT (French National Centre for Technological Research: “Nickel and its Environment”) for the “Scandium” project. Replacing iron with other elements in goethite has been the focus of a number of studies due to iron’s ability to trap a number of cations including transition metals (Co, Cr, Mn) and post-transition metals (Al, Ga) (Schulze, 1984; Ebinger and Schulze, 1989; Martin et al., 1997; Scheinost et al., 2001; Sileo et al., 2004; Alvarez et al., 2008; Bazilevskaya et al., 2011). Substitution using other transition metals with similar Z and ionic radii to Fe including cobalt (Co) and chromium (Cr) has been attempted (Sileo et al., 2004; Alvarez et al., 2008). A more recent study used both experimental and density functional theory results and showed that above 8 % atomic substitution, Al probably occurs as diaspore-like (αAlOOH) clusters within the goethite structure (Bazilevskaya et al., 2011). Goethite particles (0 % Sc) have a common needle-like structure (Fig. 3a) widely described in the past. Goethite growth has been described as a two step process (Burleson and Penn, 2006). Recently, scandium speciation was investigated in a lateritic deposit in eastern Australia and a strong association with iron oxides was demonstrated (Chassé et al., 2017). More generally, iron (oxyhydr)oxides are known to be a major phase controlling the fate of these major and trace elements in the environment (Cornell and Schwertmann, 2003; Cornu et al., 2005). For example, among all critical elements present in coal ash, Sc was reported to have the highest economic value (Das et al., 2018). Profex software (Doebelin and Kleeberg, 2015) was used for Rietveld refinement to determine the cell parameters of the (Fe,Sc)OOH samples. Replacement of iron by manganese (Mn) in goethite was achieved up to 47 atomic percent (Ebinger and Schulze, 1989). Sc is dispersed in many minerals and tends to form solid solutions (Frondel, 1968) but in such small amounts that its structural effect on the host mineral in most cases, remains unexplored. Additionally, small deviations from Vegard’s law are expected even for ideal solutions (Jacob et al., 2007). This is in accordance with the study of Jacob and co-workers who assumed that Vegard’s law is valid for ideal solutions when the lattice parameters of the pure components differ by less than 5 % (Jacob et al., 2007). More generally, it is known that oxide nanoparticles shape and size can be tuned by varying the pH which affects surface energies by proton adsorption-desorption, therefore affecting crystal growth (Jolivet et al., 2004). The ideal character of the solid solution should be confirmed by calorimetric measurements in order to ascertain the excess Gibbs free energy relative to the pure phases (Majzlan and Navrotsky, 2003). Substitution was more pronounced with aluminum (Al) and gallium (Ga) with up to 33-40 % substitution (Schulze, 1984; Martin et al., 1997). The case of gallium was also investigated (Martin et al., 1997). However clustering of Mn in the goethite structure was observed from 13 atomic percent (Scheinost et al., 2001). Conversely, the bonding of the two chains occurs through apical oxygen and hydrogen bonding (Schulze, 1984). Incorporation of Al in the structure resulted in strain and structural defects and a decrease in the cell parameters (Schulze, 1984). The synthesis of Sc-doped goethite was performed using the protocol of Schwertmann and Cornell (1991) with modifications. X-ray diffraction of the 0 % Sc sample (Fig. 1) is characteristic of the orthorhombic phase of goethite, which is consistent with Schwertmann and Cornell (1991). In the case of Al, the atomic radius is significantly smaller (53.5 pm) than in iron (64.5 pm) representing a 16 % difference in size (Shannon, 1976). The Fe (III) in the goethite structure is in the high spin state and its ionic radius has been reported to be 64.5 pm (Shannon, 1976). The Sc (III) ionic radius is 74.5 pm (Shannon, 1976), i.e. 13.4 % bigger than the Fe (III), which is close to the threshold defined by Goldschmidt for continuous solid solutions. The ionic radius of O2- (135 pm) (Shannon, 1976) is almost twice as long as the ionic radius of Fe3+ and Sc3+, Sc-O distance (2.12 Å) is only 4 % longer than the Fe-O distance (2.03 Å). Failure to incorporate more Cr was again attributed to differences in octahedral distortion but not caused by the Jahn Teller effect (electron configuration for Cr (III) is [Ar] 3d3) (Sileo et al., 2004). This is the case of scandium (Sc), which is coveted by several countries including Australia, India, Russia, and the Philippines (U.S. Geological Survey, 2018). The automotive industry has also been predicted to be a major consumer of aluminium-scandium alloy, which will further increase the demand for scandium (U.S. Geological Survey, 2018). Other applications include ceramics, electronics, lasers, lighting, and radioactive isotopes (U.S. Geological Survey, 2018). Scandium has also been found to be strongly associated with iron (oxyhydr)oxide minerals (goethite and hematite) in Greek bauxite and bauxite residue after extraction of alumina (Vind et al., 2018). Despite a few Sc-rich minerals (thortveitite, euxenite, and gadolinite), Sc does not selectively combine with the common ore-forming anions, which explains why Sc only forms small deposits, thereby preventing its widespread use (Wang et al., 2011). Zhang et al. (2005) showed that the nature and morphologies of Sc (oxyhydr)oxide vary depending on the synthesis conditions (Zhang et al., 2005).